Nevada Tiger sophomore guard, Logan McNeley, drives hard to the lane Tuesday night against Harrisonville. 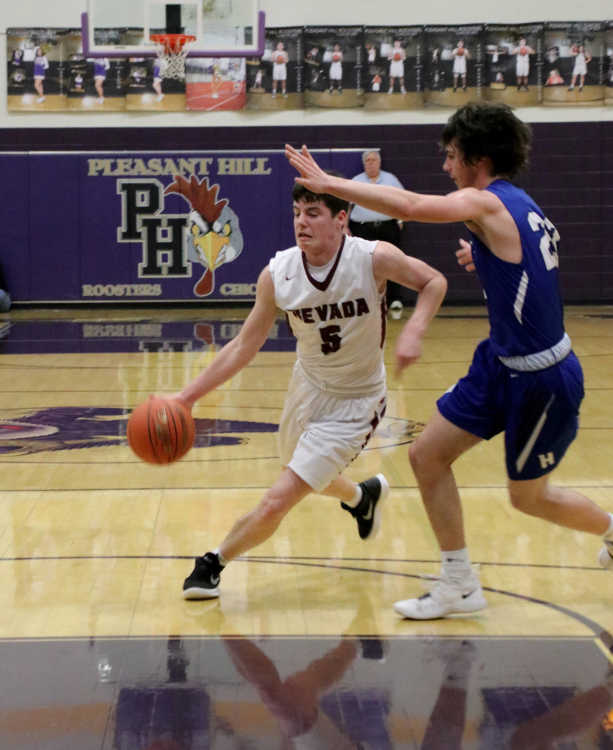 PLEASANT HILL — A lights out second half shooting performance lifted the Nevada Tigers to a decisive 80-65 victory over Harrisonville in the opening-round of the Class 4 District 13 basketball tournament Tuesday night. The third-seeded Tigers got off to a sluggish start as sixth-seeded Harrisonville hit Nevada with a 9-2 blitz to open the contest. Without starting power forward Dalton Gayman, out for a second consecutive contest due to disciplinary issues, Nevada struggled though most of the opening frame, but was able to trim the lead to two entering the second. 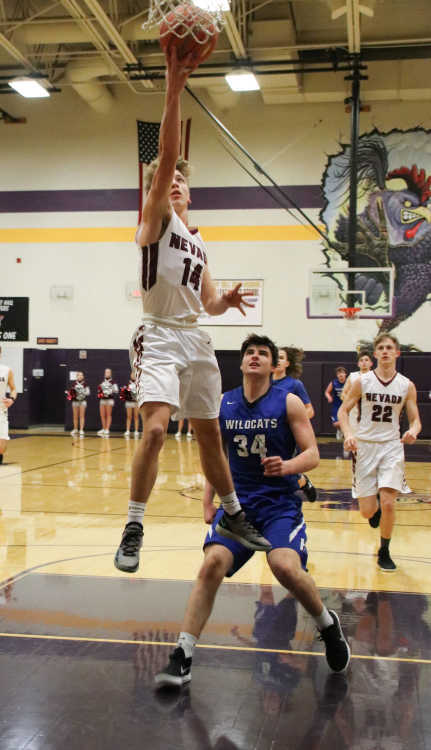 Nevada Tiger sophomore point guard Logan Applegate soars to the basket, for two of his game-high 22 points Tuesday night. Nevada (18-7) quickly knotted the contest as Logan McNeley’s lay-in to open the second frame squared things at 17-apiece. Throughout the first half Nevada had trouble defending the perimeter, as Harrisonville’s Bryce Jenkins got red-hot from 3-point land. 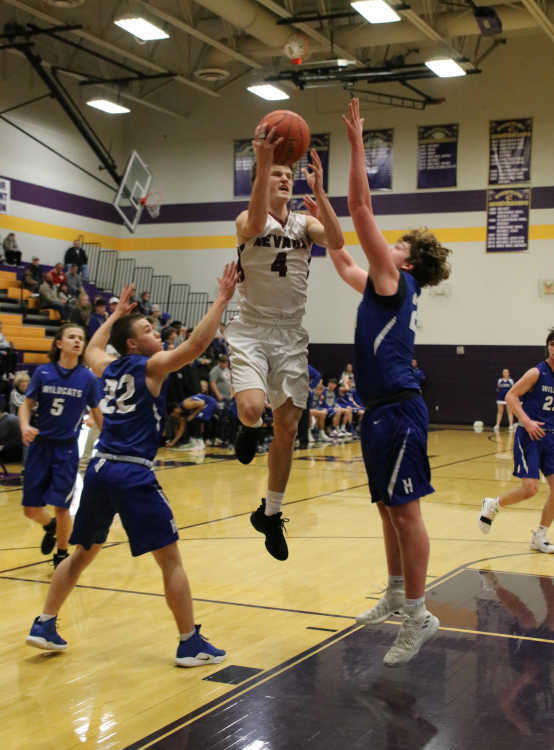 The Tigers trailed 25-23 near the midpoint of the second before going on an 11-0 run, with Matt Thompson’s bucket and trip to the charity stripe handing them a 34-25 advantage. Nevada’s lead was trimmed to a dozen at the half, as Jenkins banked in a 27-foot three just before the second quarter horn sounded. The teams exchanged triples early in the third, with Lane McNeley’s three upping Nevada’s lead to nine. Lane scorched the nets in the third with a trio of triples as the Tigers lead swelled to 16 entering the fourth. Nevada kept the pedal to the metal for much of the fourth. 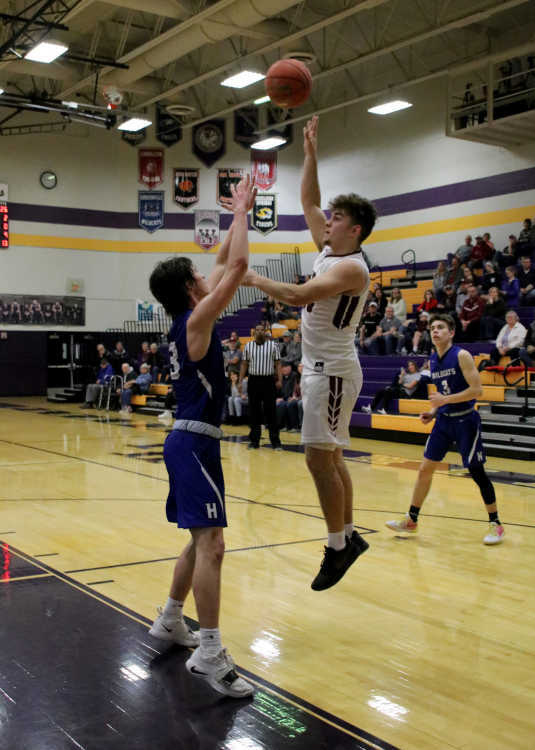 The Tigers put the cherry on top as Logan McNeley found twin brother Lane for a breakaway lay-in and an insurmountable 76-55 advantage late in the fourth. Gray said he was pleased with his squad’s overall performance, dropping in their highest point total of the season. Nevada Tiger sophomore guard Kaden Denney slashes knifes to the bucket Tuesday night. Applegate paced the Tigers with a game-high 22 points, while Thompson added 17. Joining the double-figure scoring club were senior guard Carter Swearingen (17) and Lane McNeley (15). Nevada High senior guard Carter Swearingen lofts a pass over the top of a Harrisonville defender Tuesday. The Tigers next square off with No. 2 seed Center Yellowjackets, 8:30 p.m. Thursday in Pleasant Hill.